It is particularly difficult to try and reduce the amount of waste that we generate during holidays, reunions, or other “events.” Most things that we buy, from food to decorations to gift items come in packaging that must be disposed of. Group meals are often accompanied by disposable utensils, plates/bowls/cups, straws and napkins. What “picnic” items are environmentally-friendly? One of the most challenging questions that I am asked has to do with selecting environmentally-friendly cups, plates and utensils. Unfortunately, many products are not as “green” as they appear to be. Many paper products contain bleached pulp. Many paper plates and cups are lined with a thin layer of plastic. While the paper portion will biodegrade in damp soil, the thin plastic lining will not. If the plate or cup is slightly shiny, it is probably lined with plastic. 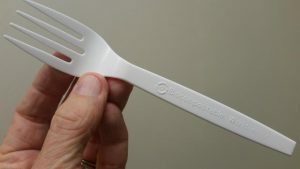 Cups and utensils that are labeled as compostable or biodegradable are made from plants. However, they are only compostable in industrial facilities, which provide high heat, oxygen and moisture. They will not biodegrade in a home composting setting. Compostable food tray, utensils made from birch and uncoated paper cup. Most traditional paper plates are made from bleached wood pulp. These products can contain chemicals from the bleaching process that are undesirable in soil. Uncoated, unbleached plant-based plates (such as those made from sugar cane bagasse or other plant materials) are a good option if reusable plates are not practical. Similarly, disposable wooden utensils made from birch can be composted in a home composter. Look for utensils that are Forest Stewardship Council certified. This certification ensures that products come from responsibly managed forests that provide environmental, social and economic benefits. There is an increasing number of products that are being made available without plastic packaging or content. Examples include toothbrushes or hairbrushes with wooden or bamboo handles, shampoo bars, and bulk foods (bring your own washable container). Many personal hygiene items may come in versions with or without plastic. For example, cotton swabs may have plastic or paper “sticks.” If you pay attention when shopping, you can avoid unwanted plastics. I carry a reusable cup, straw and stainless-steel “mess kit” in my car. That way I always have a non-disposable product readily available to me when eating away from home.